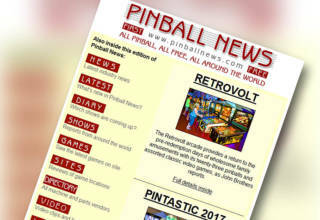 At the Texas Pinball Festival 2018 (TPF), Multimorphic unveiled another new game for their P3 pinball platform. This is their second full-featured title after Lexy Lightspeed, bringing the current total up to eight separate games. The reveal at TPF was without the typical preparatory hype and bluster. 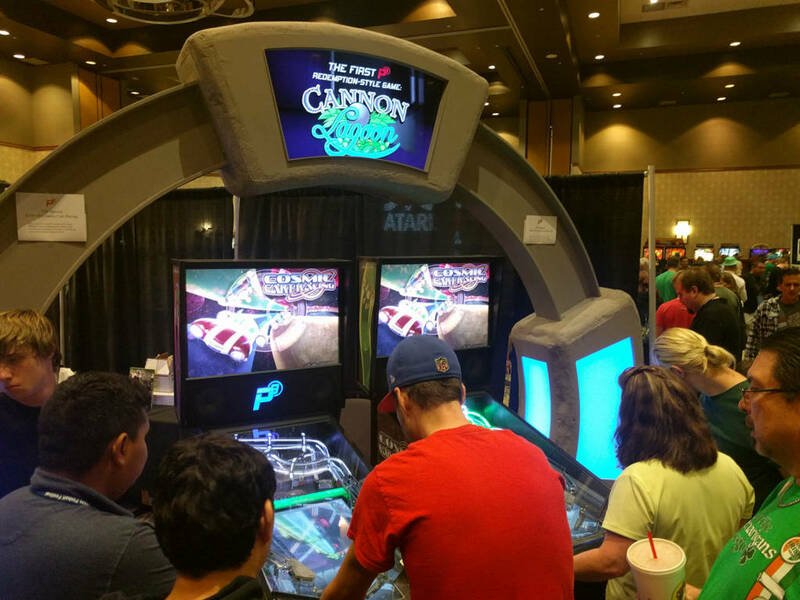 Instead, attendees were greeted with an unexpected over-sized display mimicking design elements from the P3‘s newest title, Cosmic Cart Racing (CCR). 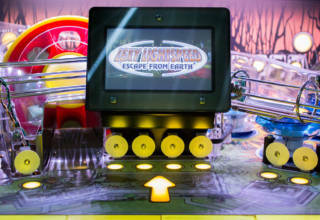 CCR was announced near the advent of the P3 platform along with Lexy Lightspeed, but in an effort to diversify the system’s offerings, Mutlimorphic founder, Gerry Stellenberg, released a number of mini games that would appeal to arcade aficionados (ROCs), family fun centers with a younger audience (Barnyard) and redemption arcades (Cannon Lagoon), as well as practice modules designed to help players hone their skills on existing games (Wizard and Secret Agent Showdown) and mini games designed to showcase and test the new platform’s capabilities (Heads-Up). This tiny area of the P3‘s dynamic LCD playfield provides an astonishing amount of information. Simply by looking at this 2″ x 4” area you can see who is in the lead, who is speeding up, who is slowing down, and who has received a power-up. Oh yes, there are power-ups. At the current version of the game, you can increase your speed via a boost, hinder the other players’ progress by leaving them road blocks, stop other players’ progress with an EMP (Electromagnetic Pulse) or obtain a shield that will protect you from other players’ use of the offensive power-ups. 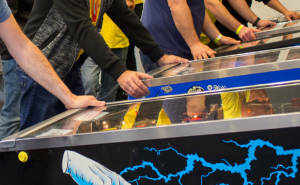 The playfield itself boasts nine separate shots that include inner and outer loops, scoops, a captive ball, ramps, and the ability to stop, divert, or reverse the path of the ball in a number of different ways. 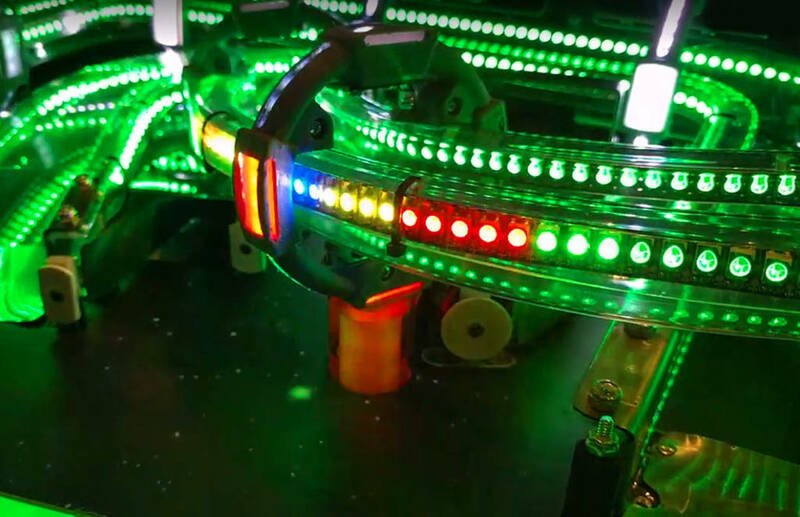 The shots are also laced with nearly 800 individually-controlled color-changing RGB LEDs which direct the player’s shots: green for shots that accelerate your speed in the race against your opponents, white for shots already hit, and a pulsing rainbow of color for areas where players can qualify and collect power-ups. 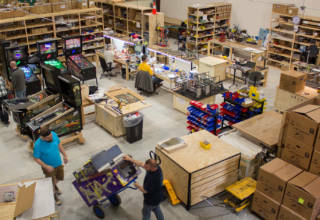 CCR has the ability to link between multiple machines – either locally or remotely – in order to play simultaneously against one or more opponents. However the machines playing CCR at TPF were not linked for their inaugural public unveiling. When asked about this choice, Gerry Stellenberg (Multimorphic Founder and CCR Chief Designer) said, “I wanted people to realize that this game is fun on its own. While simultaneous play is an engaging part of this game’s design, it is also really entertaining as a single player experience.” Gerry also mentioned that the code and polish of CCR was about 60% complete at the time of TPF 2018. If asked to critique the initial offering of CCR, I’d suggest making the information a little more apparent. Where Lexy did a great job of pointing out shots via the dynamic LCD playfield, CCR had more of a learning curve to understand the color-coded shots and what exactly they helped to achieve. The racing diagram mentioned above was also pretty small, especially for the amount of useful information it yields. 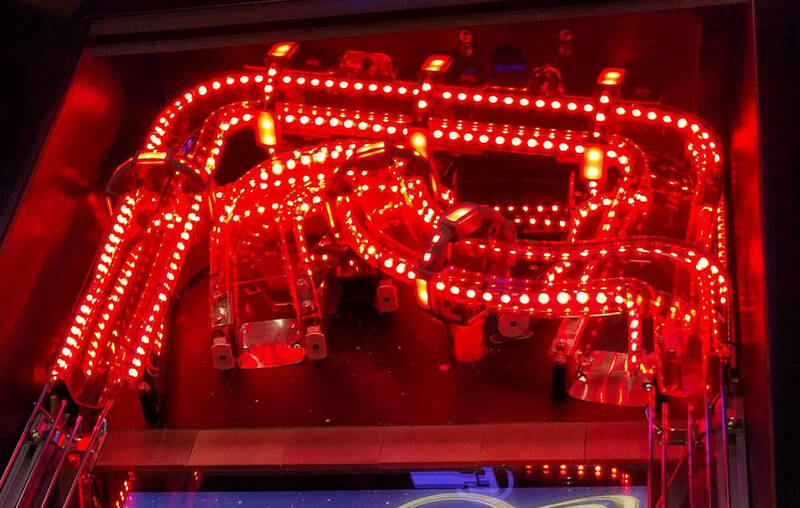 Finally, while the 800 individually-controlled color-changing LEDs are eye-catching and help to direct the player’s shots, they are also a bit intense when all directly pointing at the user’s eyes. Perhaps some frosted ramp trim on production games could help diffuse the intensity, despite the fact the LED’s have a diagnostic adjustment that allows for intensity manipulation. With that said, after the initial learning curve of a game or few, I found the title fun and challenging with a great replay factor. 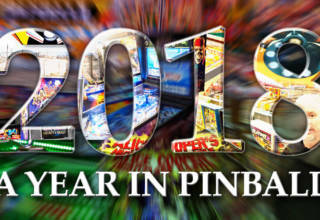 The playfield is innovative and packed with plenty of physical shots showcasing twists, turns, and unexpected ball movement to keep the experienced player interested. Finally, the P3’s newest title should also go a long way to quelling the naysayers of Lexy Lightspeed’s ‘retro’ on-screen aesthetic. The motion graphics on CCR looked quite modern and, dare I say, futuristic. 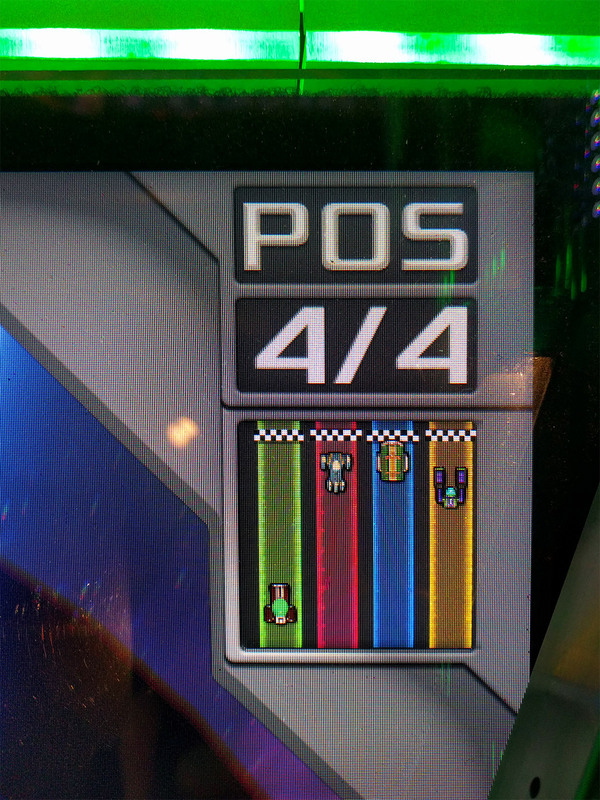 Even the start screen boasts a dazzling display of racers, which is not a treatment relegated to the start screen, but rather carried through actual gameplay. Even with the limited code and nascent user interface, there was a lot to enjoy in CCR, and the potential is overwhelmingly evident. 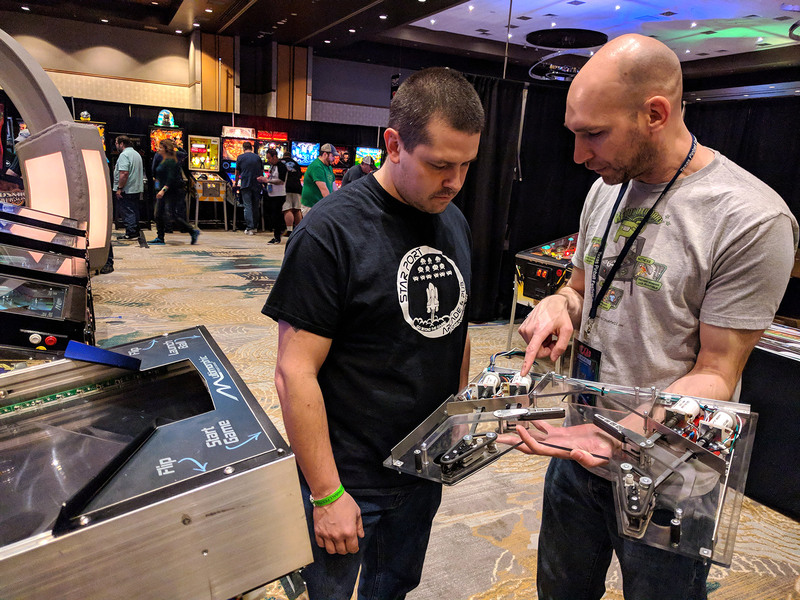 This point was driven home as Chris Meyers of Starport Arcade in Morgantown, WV arrived at the end of my conversation with Gerry to receive a service demonstration of his new P3 system purchased for his business on the TPF 2018 weekend. 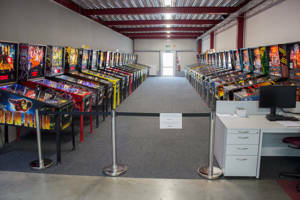 Well, Starport Arcade in Morgantown, WV, the wait is over. For anyone else in visiting distance of Morgantown, another P3 is available for public play.